Around midnight, Jim Collins, the best-selling business author and longtime rock climber, stood at the base of El Capitan. 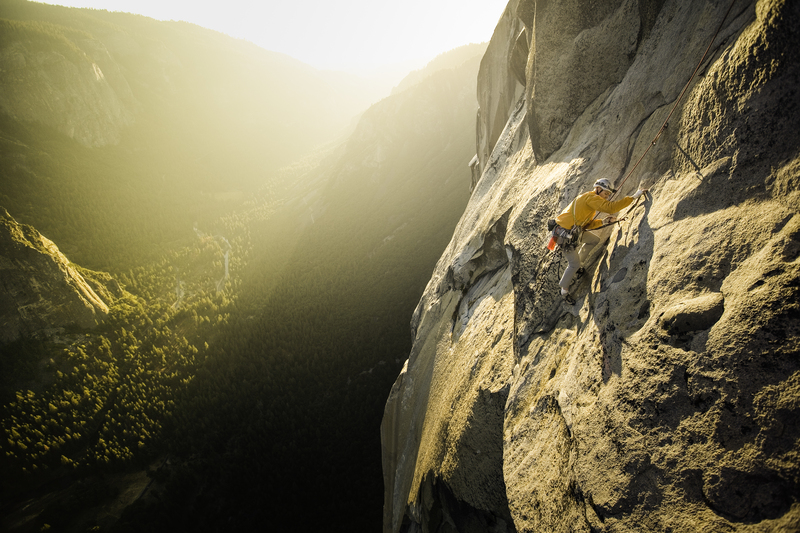 Over the next 24 hours, he would attempt to climb all 3,000 feet of the Nose of El Cap, a tough challenge known to climbers simply as the Nose In A Day (NIAD). For Jim, climbing the NIAD was something he had always wanted to do, and he had chosen a personal milestone, his 50th birthday, to finally go for it. As you might imagine, only the most experienced and competent climbers are able to actually manage the NIAD. Jim, however, was feeling pretty confident that he’d succeed as his climbing partner was none other than Tommy Caldwell, one of greatest rock climbers of all time. Tommy began climbing at a steady pace. Tommy pitched into the air, taking a surprising 30-foot fall. The rope caught his fall, thankfully, right as he landed on the very ledge from which Jim was belaying. “Whoa! Are you OK! ?” Jim exclaimed. “Yeah, I’m OK,” Tommy said. Tommy had actually blown out his shoe. In fact, his big toe was sticking right out of the rubber! Tommy, however, being one of the most humble guys there ever was, decided not to blame his faulty equipment. After all, all good climbers know to never blame your shoes for a fall—even in an extreme situation like this. Tommy also knew Jim well enough to know that if he were to tell Jim that he had blown out his climbing shoe, Jim might insist they both go down. And just like that, completely unfazed, Tommy headed right back up on lead and continued climbing at his usual world-class pace. According to Tommy, Jim is the most SMaC person in the world: Specific, Methodical, and Consistent. And he puts the SMaC down on any big goal, whether that’s authoring a new bestselling business book or even climbing El Capitan in a day. A bit of background. Jim had been training for the NIAD with Tommy over the course of the last year. With each and every training session, back home at an indoor climbing gym in Boulder, Colorado, Jim slowly worked up to being able to climb 3,000 vertical feet indoors with Tommy. They started off doing 500 feet of climbing, then 1,000 feet, then 1,500. Considering a gym is only about 40 feet tall, that’s a lot of routes! Despite Tommy’s freak fall from his climbing-shoe malfunction, all that training was paying off as Jim and Tommy chugged their way up the Nose. By the time Jim finally noticed that Tommy’s big toe was sticking out, they had already made such great progress up the wall, that they continued on with style. I was genuinely excited to have gotten an opportunity to photograph Tommy and Jim, both of whom I consider to be great heroes, as they climbed El Cap on this day back in 2008. Even though I consider Tommy one of my closest friends, he is also a guy who I might admire more than anyone else—not only for his astronomical climbing abilities but for his genuine humility while doing it all. I had never met Jim Collins before this occasion, but his books on business remain some of the most influential texts I’ve ever read. Jim is the New York Times bestselling author of “Good to Great,” among several other classics that discuss what makes companies/businesses successful. He is a great researcher, successful author, entertaining lecturer and one of the most sought after management thinkers in the business world. I actually had no idea that the great author Jim Collins was also a longtime member of our rock-climbing tribe. In fact I only learned this detail rather casually while talking with Tommy on the phone. “Yeah, that’s him,” Tommy said, unfazed and wondering why I was even so interested. To me, the most memorable days aren’t necessarily the ones where you earn a big paycheck. They’re the ones where you just go out to a cool location with your friends and people you respect, and enjoy the simple creative act of making photographs. So that’s basically how I found myself in the company of the great author and a great climber, 2,000 feet up the walls of El Capitan. That morning, I hiked up to the summit of El Cap with Beth Rodden, Tommy’s then-wife, and also one of my best friends. In addition to being a world-class climber, Beth is a trooper who is always down for a big, long day of fun and adventure. She offered to help me carry loads up to the summit of El Cap, which is no easy feat, and keep me in good company. Upon reaching the summit around sunrise, Beth and I rapped down El Cap into position and awaited the climbers. The light was brilliant, the spirits were high, and I continued to shoot photographs of Jim as he completed his goal of climbing the Nose of El Cap in a single day (actually 19 hours, to be exact). I was really happy be there to celebrate with Jim and capture the moment—the result of a lot of dedication, work and effort on his part. And, of course, a healthy bit of SMaC thinking and execution. Once we were on the summit, Beth and Tommy paired up and hiked on just slightly ahead of us. That left Jim and I to talk. Before I could even let that profound observation sink in, Jim—who is obviously an inquisitive and curious person (clearly the traits of any great writer)—started grilling me about my photography business. “What makes your business unique relative to all the other adventure firms in the market place? How do you see the photography industry changing in the next decade?” His questions were profound, precise and were really challenging me to think about my business in a new way. There I was on the summit of El Cap, speaking to one of the most important business authors in the world, about my little photo biz. I was truly humbled. Voltaire once observed that you should judge a man by his questions, not by his answer. In retrospect, I think that’s a really appropriate description of this situation. As our conversation progressed, I realized that Jim wasn’t grilling me about my business. He was actually giving me advice simply by asking questions and forcing me to think about things in a new way. I was originally in admiration of Jim because of his celebrity as an author. But after spending 45 minutes speaking to him as we hiked down the East Ledges trail of El Cap, my admiration deepened when I realized that Jim, like most core climbers, is just a talented yet down-to-earth guy. He is genuinely passionate about helping other people to run their businesses well. That selfless desire to help others—in addition to strong, compelling research gained by asking the right questions—certainly makes Jim a great author. Man, I was in pretty extraordinary company that day! I don’t know what I did to deserve this, but there I was, trying to soak it all in. I realized that the same qualities that make Jim a great writer are what make Tommy a great climber. There are a ton of people out there who can climb really well, and really hard. But the fact that Tommy is such a great, selfless guy—that’s the reason that he is great. You might think that, after spending all day surrounded by these particular brands of greatness, I might feel insecure or worse about myself. In fact, the opposite happened. I realized that being talented—whether through words, on the rock, or even through making compelling pictures—will never be good enough. Raw talent is never enough. You have to use those talents selflessly in order to make your talents meaningful. When you can use your talents to give back and empower those around you, that’s what actually makes talented people great. Great column! I’m sure you know but Jim was also the first person to free solo the Naked Edge in Eldorado Canyon (which of course he is very humble about). I’ve had the pleasure to meet Jim three times in my career (when I was working in high tech), and he is an astounding person. One of the greatest speakers (if not the greatest) I have ever heard – and I have heard a lot – and I patterned a lot of my management style and leadership around his work. And I think it was effective :-). Thanks again, Corey for this great column.